1. Cook onion and garlic and ginger in olive oil for 5 minutes. 2. Add 2 teaspoons each cumin, coriander and cinnamon; cook for 1 minute. 3. 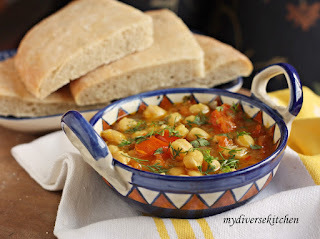 Add tomatoes, stock and cooked chickpeas. 5. Garnish with parsley or cilantro.